Making team management a rewarding experience for leaders and their teams. Leading a team can be an extraordinarily rewarding experience for leaders. However despite best intentions, some leaders end up micromanaging, making their teams give less. Here are some thoughts on what leaders can do to increase commitment the right way. 1. Give them freedom. I believe that the most effective way to get the best from people is to help them understand why they are doing something. Only then people can commit wholeheartedly, assuming they support that cause. We often hear about buy-in. I am not a fan of that phrase. Buy-in implies that someone is being persuaded to do something. If I am genuinely interested, I don’t need to buy-in. I just want to do it. 2. Give them direction. Freedom without direction creates confusion. I’ve seen teams spin their wheels when no clear direction was given to them. It is important to communicate very clearly what the expected outcomes of an effort are. Without that understanding, teams have a hard time knowing what to do and that can be frustrating and unproductive. 3. Make them accountable. Freedom and clear direction allows people to sincerely commit to whatever they’re doing, and to making sure that they do their best to arrive to the expected outcomes. An important element is to make it clear that people are accountable for achieving what’s expected from them. Without clear communication of accountability people tend to be less demanding of themselves because of lack of consequences. This downward spiral fosters underperformance and lack of growth; an outcome not only detrimental to managers but also unfair to team members themselves. 4. Get out of their way. With freedom, direction and accountability, people are equipped to show what they’re capable of. It is now time for the leader to get out of their way. Leaders must resist the temptation of telling people how to do something. Instead, tell them what they need to do (give them direction) but don’t tell them how to get it done. Give them the chance to teach you something. You may be surprised. 5. Trust them. Very few things are as demotivating as feeling that someone doesn’t trust us to do a good job. Trusting someone sets an unspoken commitment for that person to do their best to achieve whatever it is that we expect from them. Be careful not to put someone in a position where they don’t have the means to accomplish what is expected of them. But when they do have the means, just trust them. Knowing that you trust them will empower them to accomplish a whole lot more. 6. Give them the right tools. People need the great tools to do a great job. Anything less translates into an unnecessary hurdle to overcome. Software developers need the fastest, most modern computers available. Digital designers need the largest and highest quality displays. Give them anything less, and they will be wrestling with inadequacies that aren’t core to their expertise. 7. Learn from them. I first became familiar with the myth of the complete leader when I read the article In Praise of the Incomplete Leader published in the February 2007 issue of the Harvard Business Review. Until then, I was under the assumption that great leaders had all the answers. I was wrong. There is no such thing as the complete leader. No one can be great at everything. Great leaders aren’t afraid of recognizing their weaknesses and surrounding themselves with people that can help balance them. Ironically, the worse leaders—those not entitled to be called leaders—are the ones that project an image of complete strength. Such self-confidence is often masking deeply rooted weaknesses. 8. Expect more. The Pygmalion effect states that the greater the expectation placed upon people, the better they perform. Give your team enough information to help them make better decisions. Let them know that while they have the freedom to experiment, they are accountable for delivering the expected results. 9. Help them see the big picture. Unlike leaders, members of specialized teams have a laser-focused mind. This narrow field of vision is what makes experts be experts; their deep specialization is what makes them so good at what they do. Leaders on the other hand, have a 360-degree searchlight mind that enables them to hold divergent ideas about a single concept. Use this capability to show team members the implications of certain decisions or considerations that they may not be attuned to. In the same way team members can teach you a lot about a little, you can teach them a little about a lot. 10. Help them grow. Always be looking for new skills that will not only make the team stronger as a unit, but that will develop the individual team members in their own personal career. Care deeply about their wants and needs and look for ways to satisfy their desires to better themselves. Don’t wait for formal performance reviews and career planning sessions to put new challenges in front of them. Do it regularly and consistently. 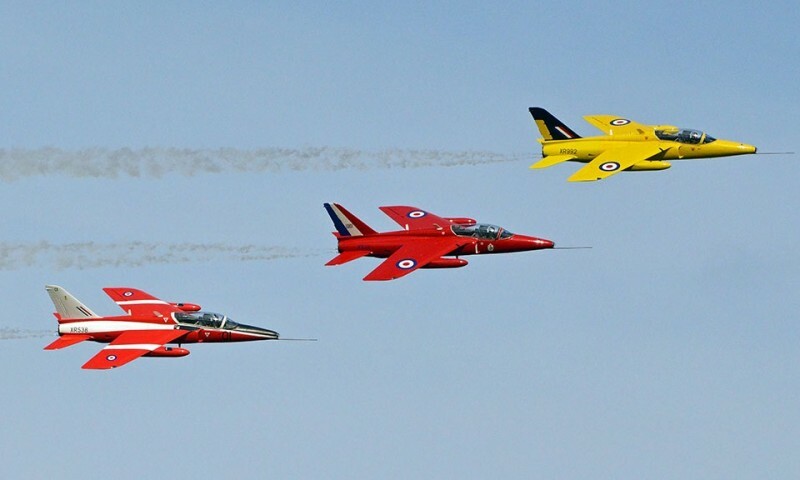 The photo used in this post is Gnat Display Team – RAF Waddington by Alan Wilson. It is used under the Creative Commons Attribution-ShareAlike 2.0 Generic license.